I've had some great luck with finding new cars at the store these days...seems like every time I check I find one or two! Found this one yesterday; the new single pack release of Mama Bernoulli! This is a standard Mattel 1:55 scale diecast and is # 8/9 of the 2014 "Race Fans" sub-series. 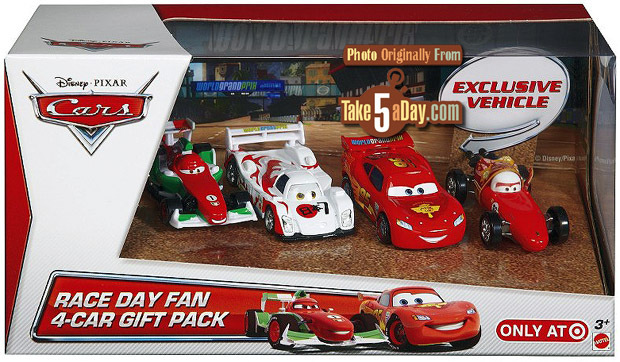 She was originally released only as an exclusive in the Target "Race Day Fan 4-Car Gift Pack". 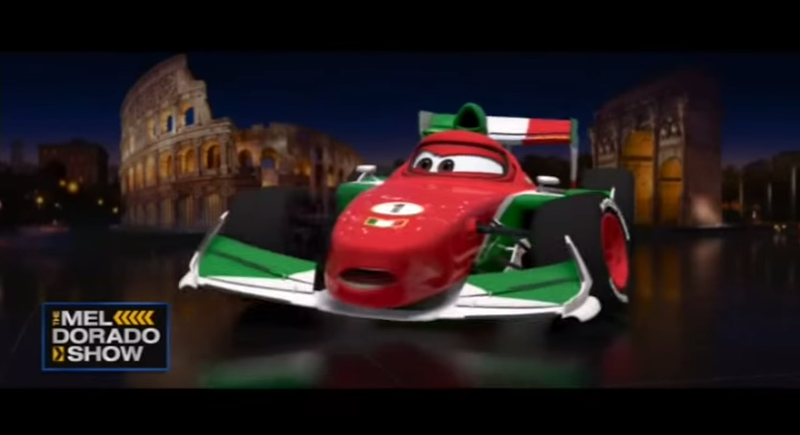 Mama Bernoulli is seen in Cars 2 near the beginning of the Porto Corsa Italy WGP race. She is Francesco Bernoulli's "mama." This one was just released, so be sure to check your local store if you're still trying to track this one down! If you'd rather just save time, you can pick her up on either Amazon or eBay. As usual, best of luck on the hunt and hope you all have a happy and safe new year. 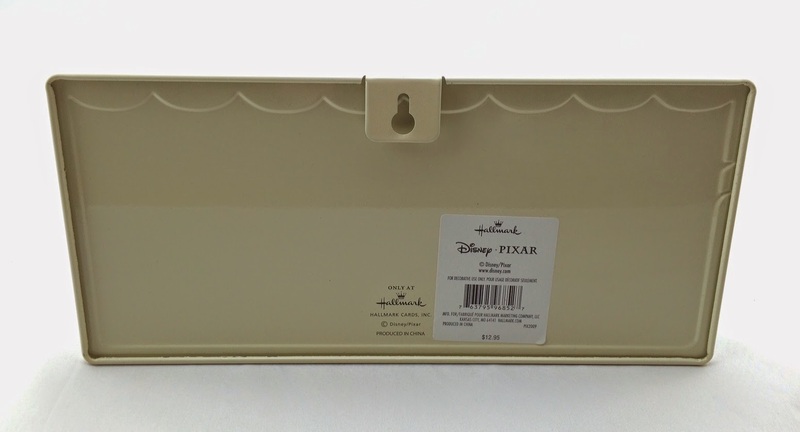 This past month, Hallmark stores released a brand new exclusive line of Disney/Pixar decorative products. I had heard about this through through the grapevine and, when I arrived at that section of the store, I was surprised by how many great items there actually were. I wanted them all! One of items I was immediately drawn to was this fantastic 11" X 6.25" tin plaque featuring a cute, minimal style scene showcasing Nemo, Dory and the film's famous quote "Just Keep Swimming." For Christmas, my parents surprised me with this and most of the merch that was there! I was so thrilled and I'm excited to share with you more of it in the coming weeks and months. At the store, it was displayed on simple plastic easel (which would be my preferred method of display) but it also can be hung flat on the wall. It retails for $12.95, which I think was a very reasonable price. This is a quality, sturdy, adorable collector's piece and I couldn't be happier with it. You can find it online HERE or be sure to head to your local Hallmark store! Hurry though, these types of things come and go fairly quickly there and then are almost impossible to track down. Good luck finding this and please let me know if you have any questions or comments. Note: You might notice a slight change in my product photos. That's because of this awesome Fotodiox product photography studio in a box that I got for Christmas! Please bear with me as I'm striving to learn how to increase the quality of photos here on the blog. 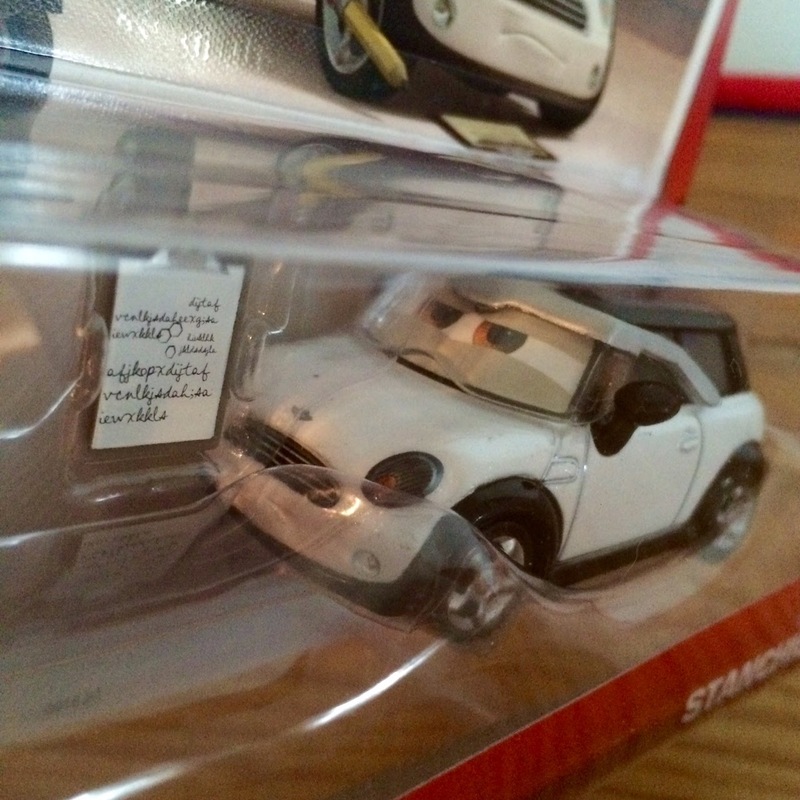 The new 2015 series of Mattel Disney/Pixar 1:55 scale cars have begun trickling out over the past month or so...and I was lucky enough to find the first case of the new year at my local Walmart this past week! Here we have Ponchy Wipeout (also known by his sponsor, Bumper Save), a re-release, # 3/18 of this new year's "Piston Cup" sub-line. 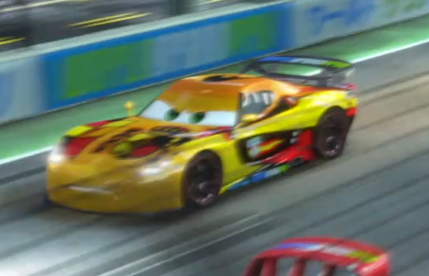 This character is seen very briefly during the opening Piston Cup race at the beginning of Cars; he's one of the racers, but he goes by in a blur so it's very hard to spot him. I love the 2015 design of the package, it's so fresh! It's always nice to get a new card design with the start of the new year. If you missed Ponchy's previous releases, be sure to keep your eyes out for this one in stores now. He should just be getting pretty easy to find - good luck on the hunt! Just a few weeks back, my brother Rob (of Herofied Art) created me my first official blog logo (see full post HERE if you missed the write-up). On Christmas Eve, he completely took me by surprise by hooking me up with a full color wood print of it to display amongst my collection! Boy was he right. This looks absolutely fantastic! "These truly unique prints have to be seen and felt to be believed. They exude a vibe that feels both vintage and modern all at once. It is always intriguing and exciting to see how each of my images look on wood - colors mellow and warm tones really make themselves at home. 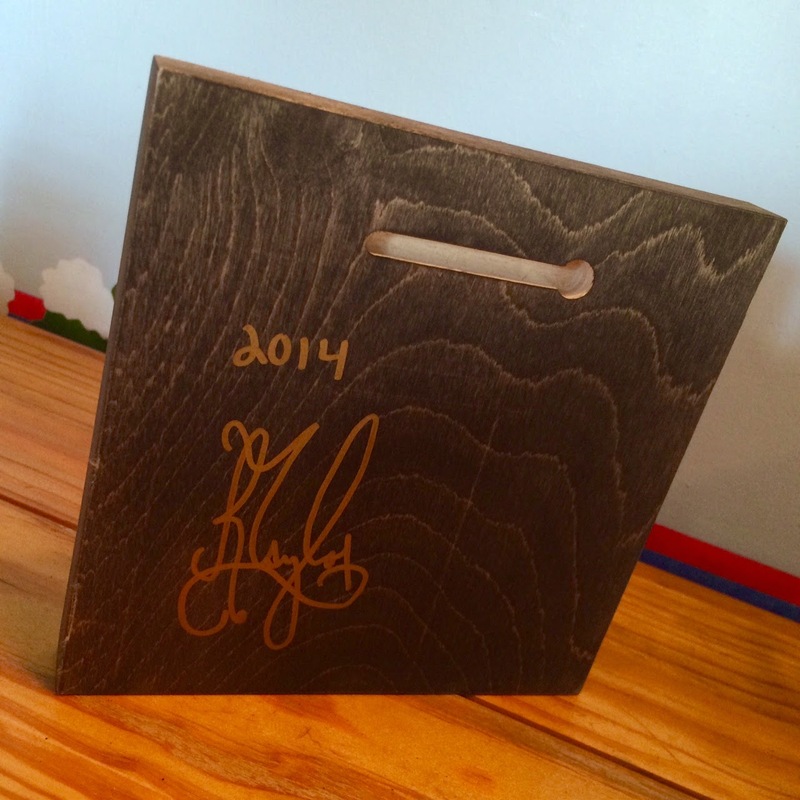 Each WOOD print is made using the highest quality materials and processes. 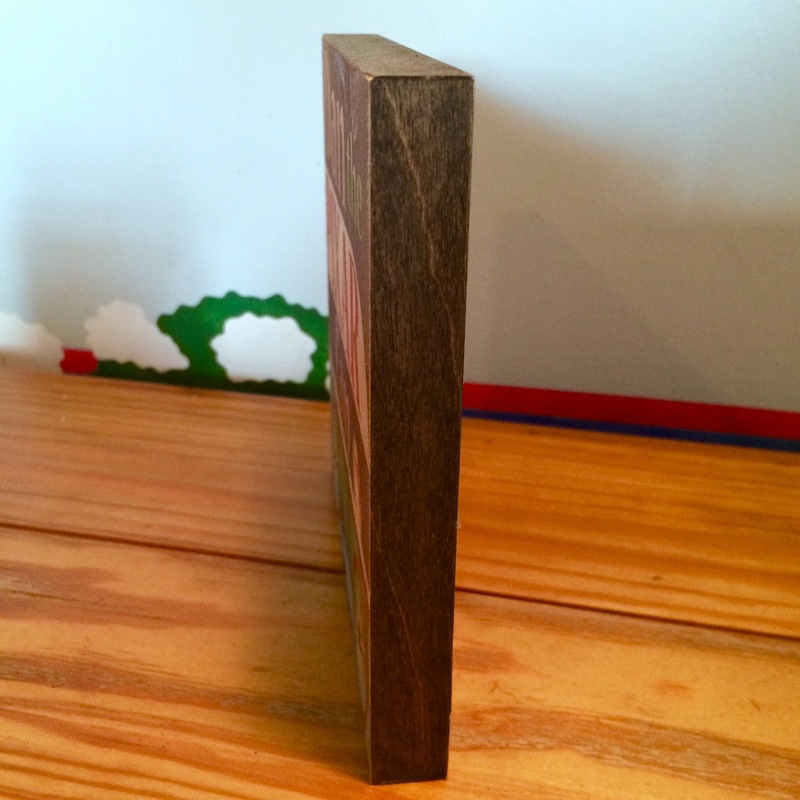 Every piece of wood is hand selected then specially sealed before printing. Next, fade resistant UV inks are used to print the image directly onto the board. Each board is then coated with a special UV finish to seal the image and provide further protection against fading." A HUGE thanks to Rob for giving me this amazing, thoughtful surprise and for all the work that went into it. It will be treasured and displayed proudly! For the past week, I've been visiting my home in Connecticut for Christmas break. It always brings back so many great childhood memories being home, since nothing ever seems to change around here. While I was hanging out in my basement today, I started looking at the shelf down there that's filled with all the VHS tapes I grew up watching...pretty much all there still right in the same spot! 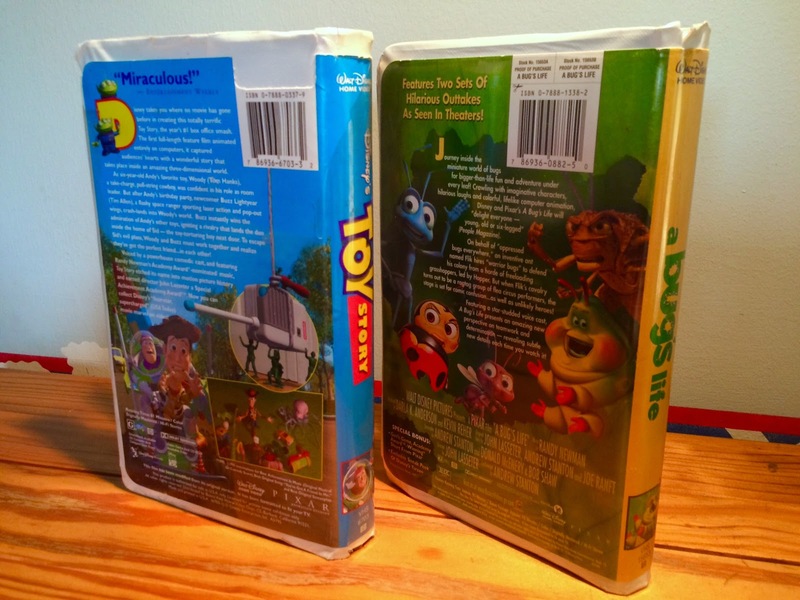 I then noticed my original VHS copies of Toy Story and A Bug's life and thought to my myself, "hey, these are just as much a part of my Pixar collection as anything else I have"; so I figured I'd throw them up here on the blog, cause, why not? 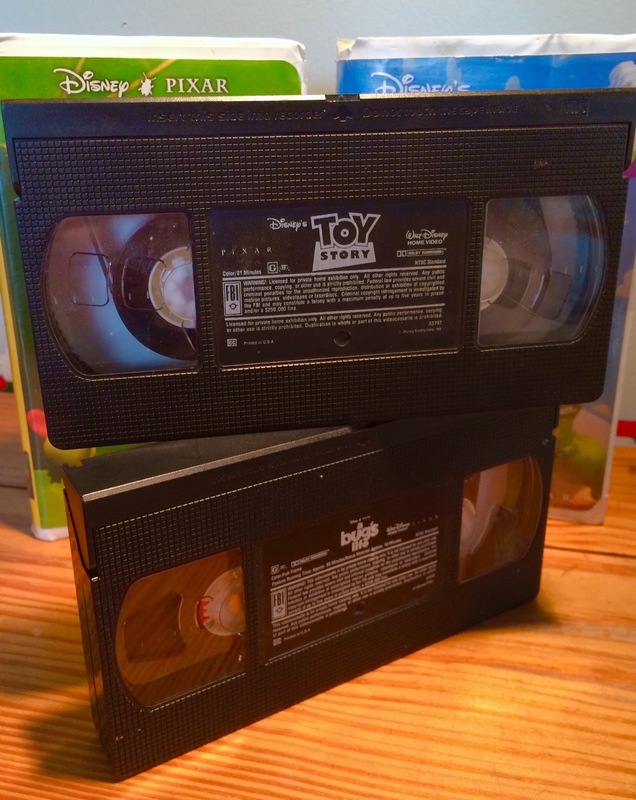 These are the only two VHS Pixar movies I ever got since, by the time Toy Story 2 was released on "home video", DVDs were available. I vaguely remember getting Toy Story when it was released but I vividly remember getting A Bug's Life. I remember my dad picking me up from school (I was in fourth grade) and having the VHS there waiting for me in the car. 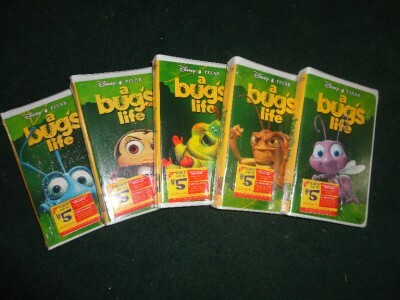 You probably recall that when A Bug's Life was released on video, there were five front covers to choose from featuring either Flik, Francis, Heimlich, Hopper or Dot. I had wanted Heimlich since he was my favorite character at the time (and probably still is) and my dad surprised me with it that day.Which cover did you have back in the day? Shout it out in the comments below! I also thought it was a tad interesting to see how prominent "Disney" is on the original Toy Story cover and tape and how "Pixar Animation Studios" is much less noticeable in the bottom corner. 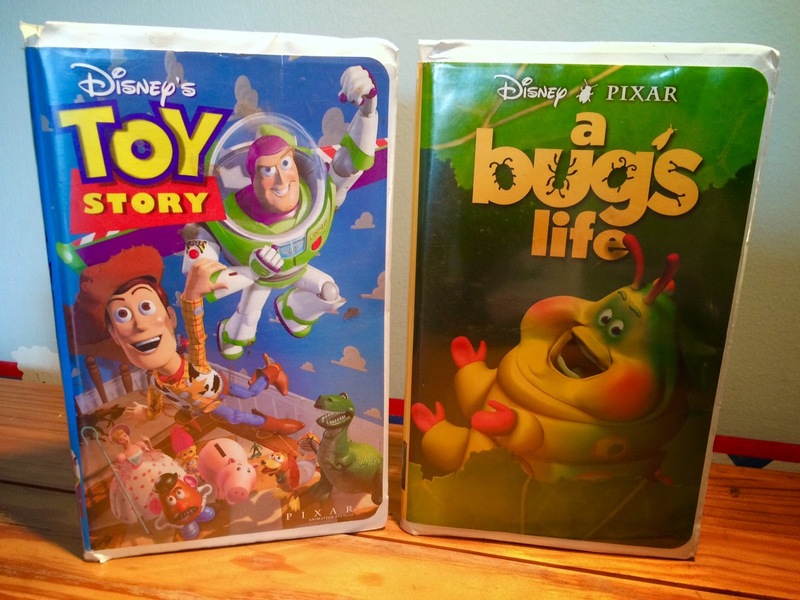 I bet Pixar felt jipped as it seems it didn't take long for them to get their name alongside Disney's (since the A Bug's Life cover has it how we know it today-with both company names equally above the film's logo). Have any questions, comments or suggestions? Be sure to contact me through email, social media or by leaving a comment here on this page. 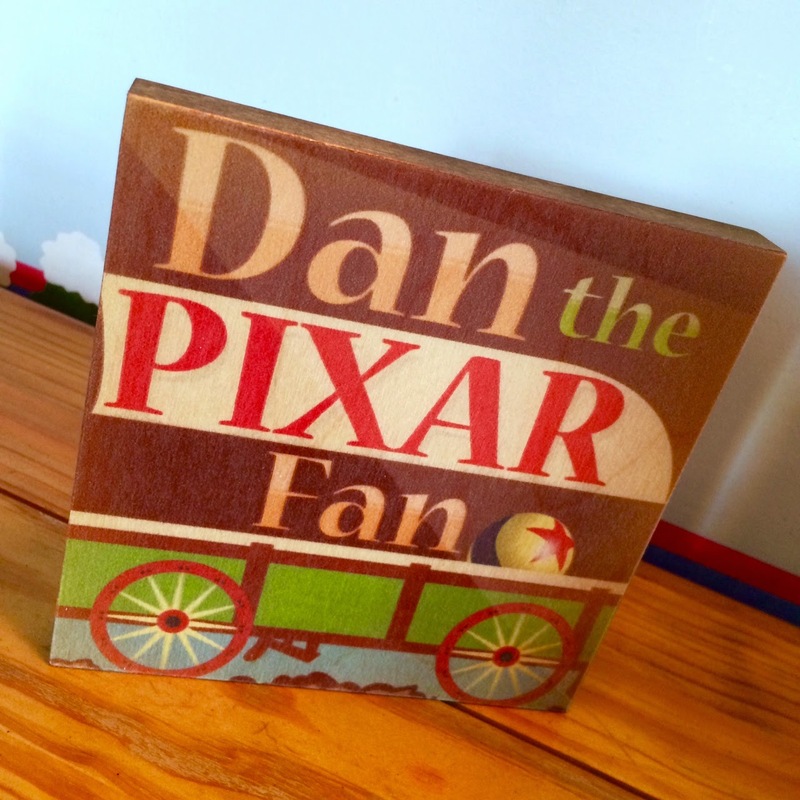 Thanks for stopping by and be sure to come back daily for more from my Pixar collection! My Cars collection continues today with the "Pit Stop Launchers" Miguel Camino. Miguel is a standard 1:55 scale diecast from the original 2011 Mattel Cars 2 collection and is exactly the same as the "mainline singles" release. Included here in this pack is a plastic World Grand Prix (WGP) style launcher which sends the the car flying from the base with the press of a button. All of the 11 WGP racers from the film were released in this "Pit Stop Launchers" line and can be connected together for racing fun. When I got this set, back when the Cars 2 line was just released, it was the only way to get this character's diecast (that's why I got it). At the time, he was not yet released as a single, but of course it wasn't long before he was (he ended up being #23). The same story goes for Lewis Hamilton, who ended up being #24 within the "mainline singles" (see post HERE). I'm so excited to reveal here and share with you my many new items that have been added to my collection as of yesterday...so definitely stay tuned for that starting next week! Merry Christmas everyone! I hope you are all having a fantastic, safe and festive holiday. My Cars collection continues today with the "Pit Stop Launchers" Lewis Hamilton. Lewis is a standard 1:55 scale diecast from the original 2011 Mattel Cars 2 collection and is exactly the same as the "mainline singles" release. When I got this set, back when the Cars 2 line was just released, it was the only way to get this character's diecast (that's why I got it). At the time, he was not yet released as a single, but of course it wasn't long before he was (he ended up being #24). The same story goes for Miguel Camino, who ended up being #23 within the "mainline singles" (see that post HERE). Alright - short and sweet - gotta get back to fun, family and Christmas magic! I'm so excited to reveal here and share with you my many new items that have been added to my collection as of today...stay tuned for that starting next week! 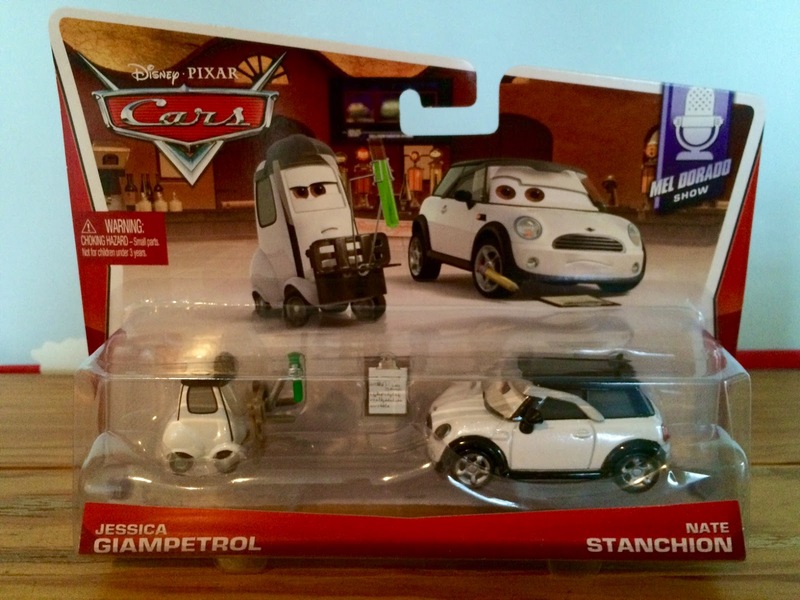 Here's another fantastic brand new Cars 2 movie moments 2-pack featuring "Allinol" scientists Jessica Giampetrol and Nate Stanchion! These are 1:55 scale diecasts from Mattel and are part of the 2014 "Mel Dorado Show" sub-series (#s 7 and 8 out of 9). As shown on the left side of the screenshot above, these characters appear briefly in the film during the "Mel Dorado Show" news story that covered Miles Axlerod and his alternative fuel called Allinol. They are some of the "scientists" that worked on developing the fuel, alongside side Lee Race (who was also released earlier this year, seen HERE). I love the addition of the notepad accessory included here in this set and that Jessica is holding onto a test tube like in the film! Also, you can't tell from my picture, but yes, Nate is holding his screen accurate pencil as well. It's a little hard to tell here in the pictures, but their paint job is a sparkly, metallic finish and not just plain white; very well done. If you're looking to find this 2-pack for your collection, head to your local store for a good chance at finding it (since it was literally just released). I found it just last week at my local Walmart. Otherwise, you can pretty easily just find this online on Amazon or eBay. Good luck on the hunt as you fellow collectors finish up your 2014 Cars collection as I'm trying to do. I've had some great luck lately while looking for new Cars releases in stores! I've driven from store to store during this past week and have found quite a few that I was looking for...including this very cool Shawn Krash & Sal Machiani 2-Pack. These are 1:55 scale diecasts from Mattel and are part of the 2014 "Allinol Blowout" sub-series (#s 4 and 5 out of 9). 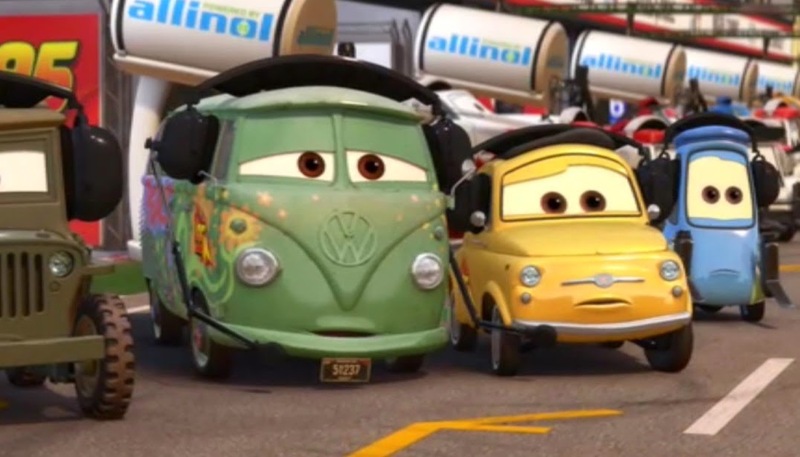 As shown in the screenshot above, these two characters appear briefly in Cars 2 during Porto Corsa race scene when the racers' engines begin to get blown out by the evil lemons. Shawn is a race fan seen standing in the street crowds drinking a can of Allinol (in which he kicks out of anger) and Sal is [half] seen in the background selling the cans at the Allinol booth. I love the addition of the Allinol can accessory included with this set so that you can recreate the scene from the film. 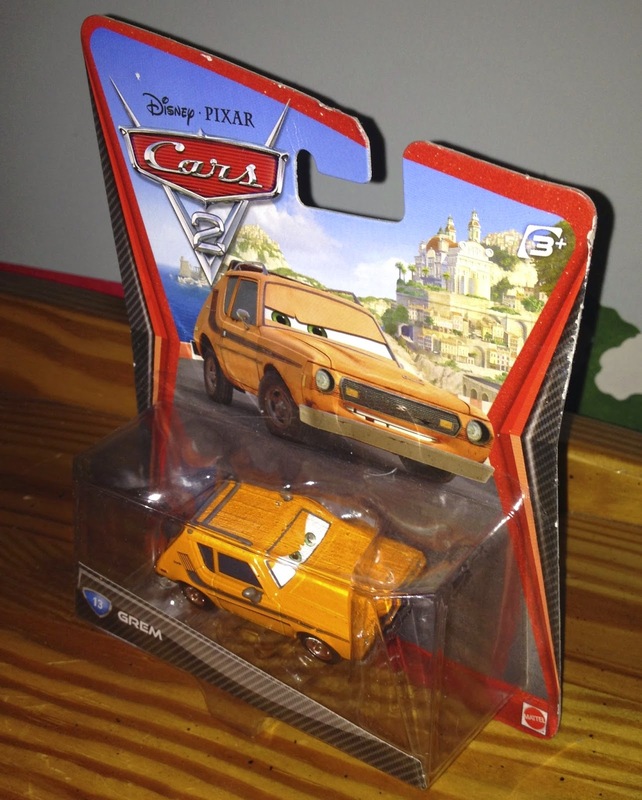 Interestingly, another "Sal Machiani" was released previously in a 2-pack with Mater a few years back, yet that version was a much lighter yellow while this one is much more orange (which is actually more movie accurate). 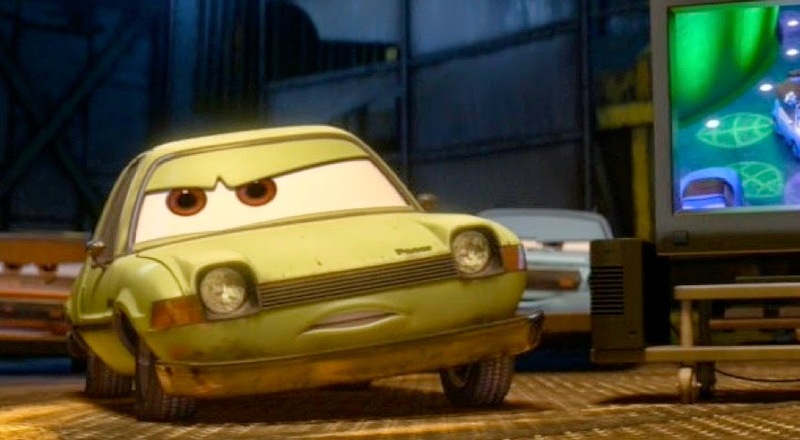 In the film, there appears to be a couple of these same looking cars seen throughout Porto Corsa (see screenshot from previous Sal Machiani post), so which one is Sal? Are all these guys named Sal Machiani? If you're looking to find this 2-pack for your collection, head to your local store for a good chance at finding it (since it was literally just released). Otherwise, you can pretty easily just find this online on Amazon or eBay. Good luck on the hunt as you fellow collectors finish up your 2014 Cars collection as I'm trying to do! Just recently released by Mattel, here is their new 1:55 scale 2-pack featuring Race Team Luigi and Guido with Headsets! These are #s 4 and 5 out of 5 of the 2014 "95 Pit Crew" sub-line and followed the releases of Mater with Headset, Sarge with Headset and Fillmore with Headset. Lightning Mcqueen's race team from Cars 2 is now complete - headsets and all! If you're looking to find this 2-pack for your collection, head to your local store for a good chance at finding it. Otherwise, you can pretty easily just find this online on Amazon or eBay. Good luck on the hunt as you fellow collectors finish up your 2014 Cars collection as I'm trying to do! 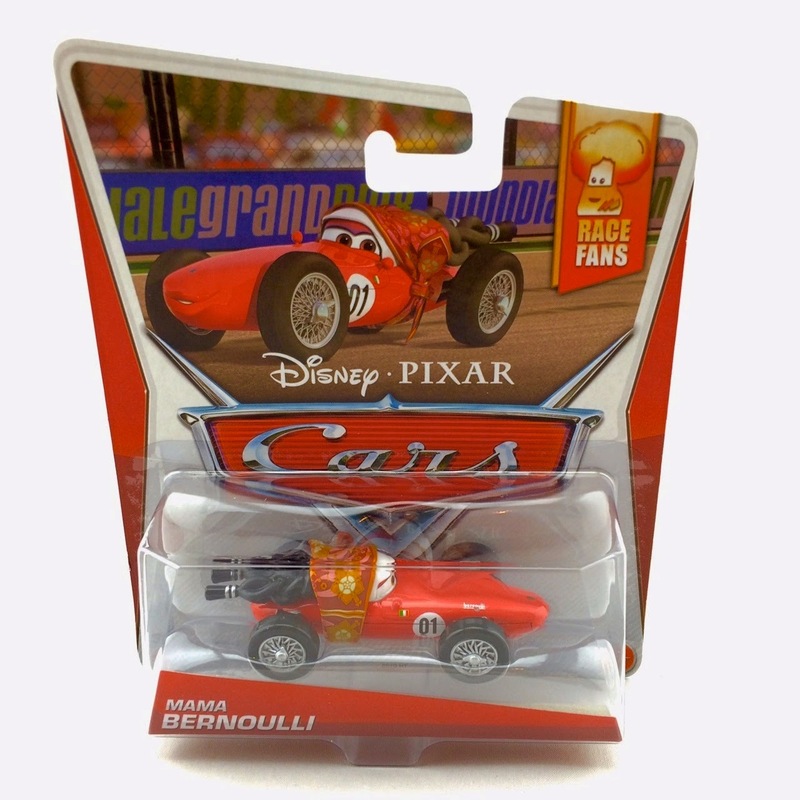 As a Disney/Pixar Cars collector, you know that there is no shortage of supply out there when it comes to Mattel's 1:55 scale Francesco Bernoulli diecasts. Since 2011 with the release of Cars 2, you really can't go to a store without still seeing about 15 of them- you know what I'm talking about! Well, we have yet another one that has just been released, but this time it's a somewhat new version of the character! It's not much different, but hey, it was different enough for me to pick up. Here we have the newly released "Interview Francesco" based on the scene in the film when Francesco was shown as a guest on the "Mel Dorado Show." The main, yet subtle, difference with this version compared to the standard release is the facial expression; this one appears to be angry and yelling just as he did during this scene when Mcqueen insults him by calling him "fragile" (screen shot from that moment above). This release is #9/9 of the 2014 "Mel Dorado Show" sub-series. He just came out within the last month and I was able to find him just a couple days ago. If you're looking to find this one for your collection, head to your local store for a good chance at finding him. Otherwise, you can pretty easily just find him online on Amazon or eBay. Good luck on the hunt as you fellow collectors finish up your 2014 Cars collection! Here we have last year's release of David Hobbscapp with Headset! This is a 1:55 scale diecast from Mattel and was part of the 2013 "WGP" sub-line (#13/17). 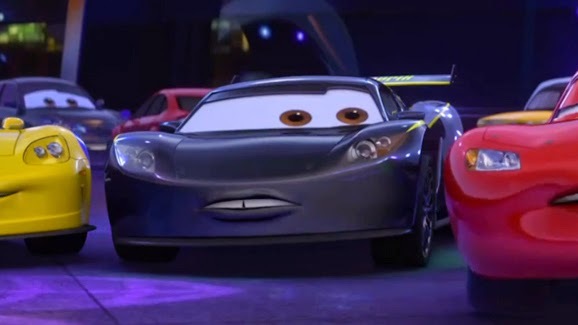 As shown in the screen shot above, David is seen in Cars 2 as a commentator for the World Grand Prix (WGP). He was originally released (without headset) as an exclusive in the "Tokyo Race Day 7-Pack" that was available only at Target stores a while back. Trivia: David is based on real life former British racing driver David Hobbs who currently works as a commentator for Speed Channel. Even though this one isn't available in stores currently, he can be easily found online (such as on Amazon or eBay) if you're trying to track this one down for your collection. From the original Cars 2 collection, here we have Mattel's 1:55 scale diecast release of Petrov Trunkov (#18); he was released in 2011. Don't recognize this character from the film? That's because, like Don Crumlin from yesterday's post, Petrov actually never appears on screen (well, he might be there somewhere, but there is no confirmed appearance, just lots of speculation on possible sightings)... so with that, I was not able to include a screen shot here. Perhaps this was an old design for Acer (one of the main "lemon" henchman) that was ultimately changed late in the game? I certainly believe so. What makes me think that is that this character design also appeared in a Lego set (with a magnetic pulse camera), in the background on the box of the "Spy Jet Escape" track set next to Grem and in this old piece of concept art (also during the airport scene). This makes it seem like he had a prominent role in the movie, especially since those images in the links above are all associated with scenes that featured Acer and Grem in the final cut. What do you think? If anyone has additional thoughts or details, sound them off in the comments below. Regardless of whether Petrov does show up in the background at some point during the film or not, one can't have too many "lemons" to build up their army. If you're still looking to add this one to your Cars collection, be sure to head to Amazon or eBay for the best prices. 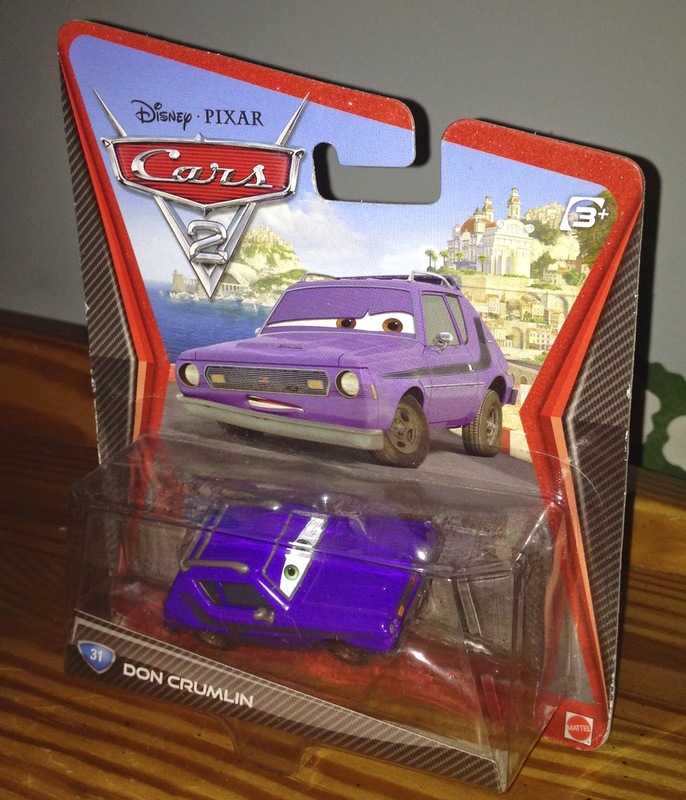 From the original Cars 2 collection, here we have Mattel's 1:55 scale diecast release of Don Crumlin (#31). This character was released in 2012. Note: Don is actually never seen in the film (or at least there is no info online whatsoever regarding his appearance); so with that, I was not able to include a screen shot here. He his often confused with J. Curby Gremlin, however, they are completely different shades of purple and have some very different design elements. Perhaps this was an old design of Curby? Or is this a different character that was cut completely from the final version of the film? If anyone has additional thoughts or details, sound them off in the comments below. Regardless of his appearance, one can't have too many "lemons" to build up their army. If you're still looking to add Don to your Cars collection, be sure to head to Amazon or eBay for the best prices. I've noticed an unintentional "lemons" theme throughout most of my posts these days, so why not continue that trend today with the original 2011 Cars 2 (#13) Mattel 1:55 scale diecast release of Grem! Grem, of course, is one of the film's main "lemon" villains; a sleazy henchman to Professor Z often seen with his partner in crime, Acer. Grem has been released many times over years, mostly in 2-packs and multi-packs with other diecasts. There has also been some other versions of this character released as well, such a Grem with weapon and the "Deluxe" Grem with camera. 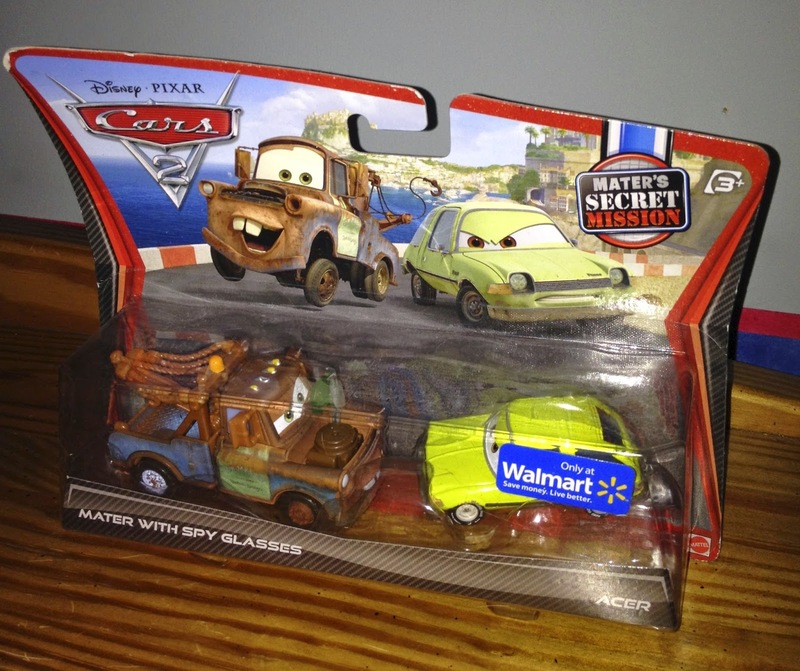 Back in 2011, this Mattel "movie moments" 2-pack featuring 1:55 scale diecasts of Acer and Mater with Spy Glasses was released as a Walmart exclusive ("Mater's Secret Mission" sub-line); it was part of the original Cars 2 series. 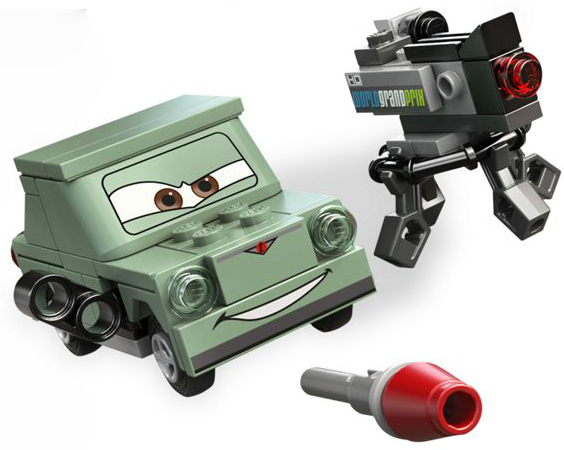 The strange thing about this pack is the inclusion of Mater with Spy Glasses, as nowhere in the entire film does he appear this way. Could this be an abandoned concept that was cut from the film after Mattel had already created the diecast? Or was it made up completely by Mattel? Shout out what you think below! Acer, of course, is seen throughout the film and is one of the main "lemon" villains. 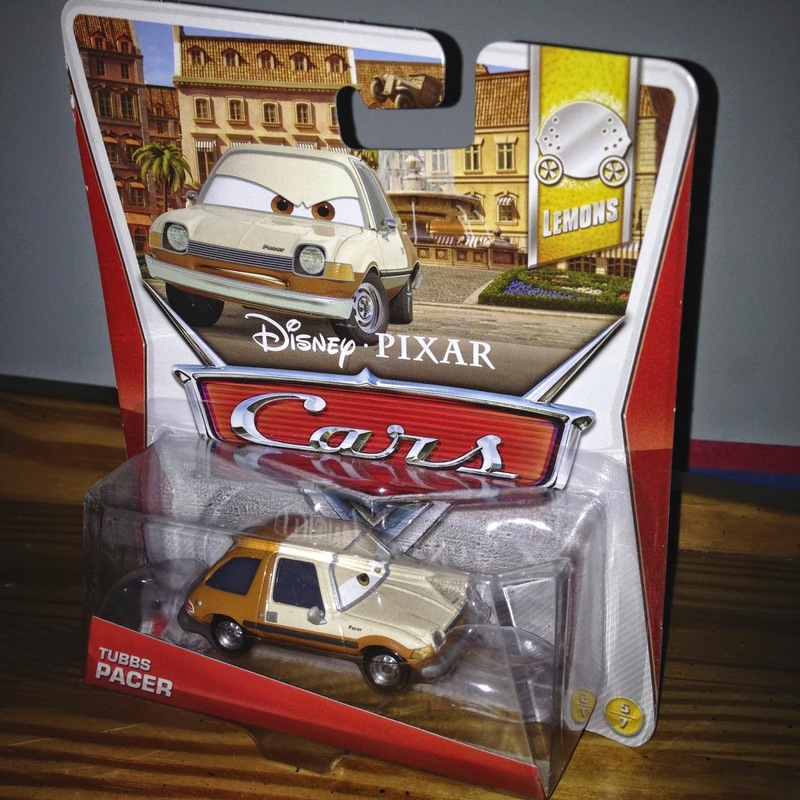 Here we have the Mattel 1:55 scale diecast release of Tubbs Pacer from Cars 2! He was released last year as part of the 2013 "Lemons" sub-line (#5/7). In addition, there was also a "paint spray" variant/version of this character released in a movie moments 2-pack (seen HERE). In the film, Tubbs Pacer is the head of the Pacer family who works for Professor Z; he is seen during the big lemons meeting at the Porto Corsa casino and makes several appearances after that during some of the film's final scenes. 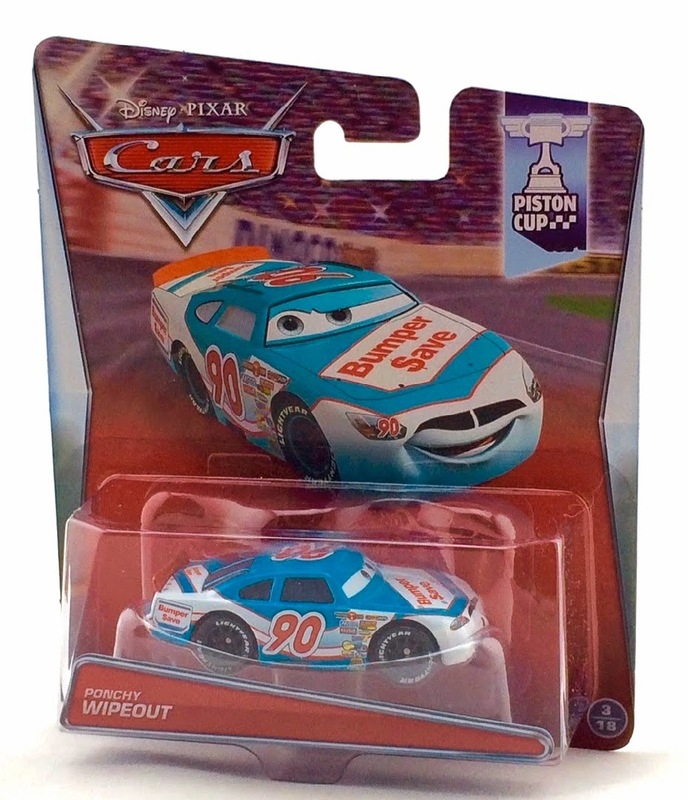 If you're a Pixar Cars fan or collector, be sure to explore my "Cars & Cars 2" label to the right of this page to see my entire collection of diecasts and other merch posted thus far. More to come soon! 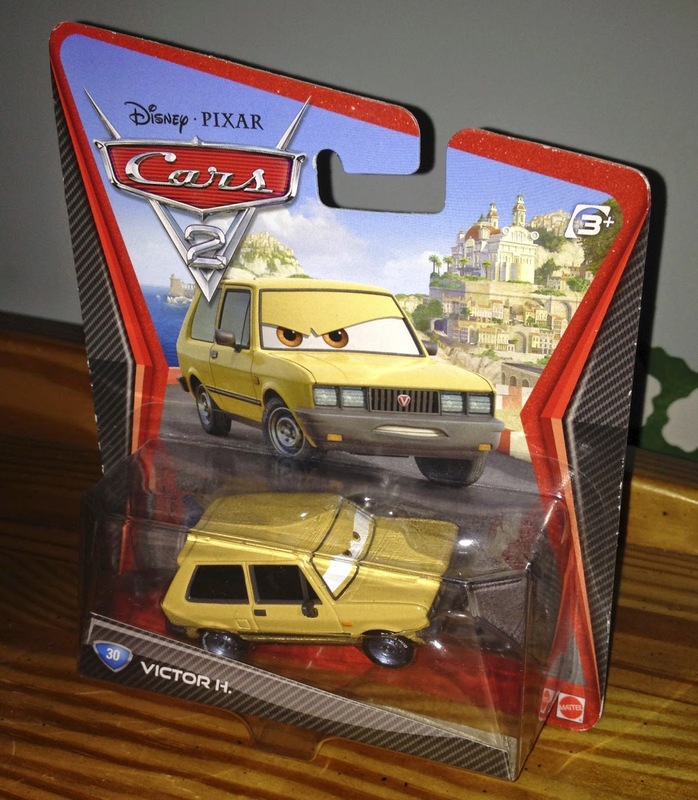 Here is the Mattel 1:55 scale diecast release of Victor Hugo from Cars 2! 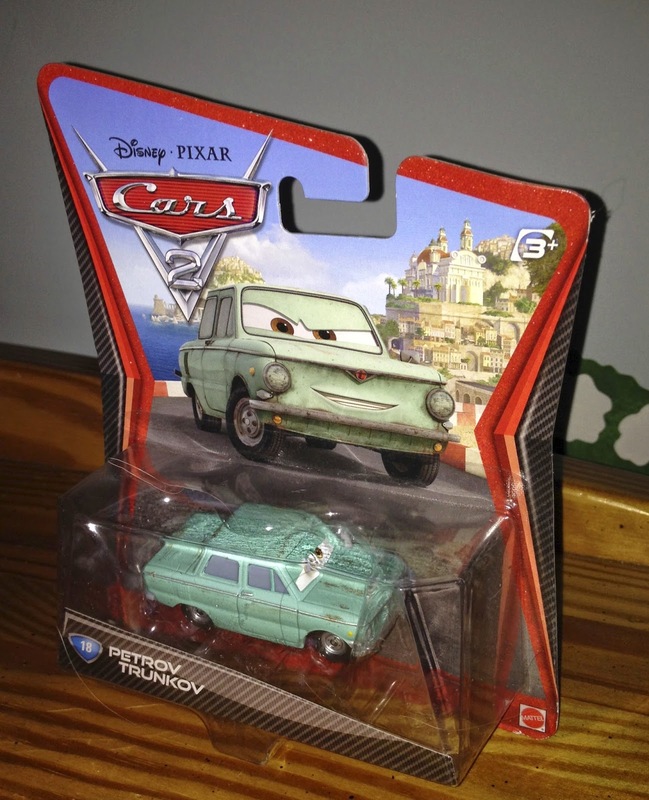 He was first available in 2012 as part of the original Cars 2 series (#30, seen below) and then was re-released in the 2013 series ( as part of the "Lemons" sub-line, #2/7). In the film, Victor H. is the head of the Hugo family who works for Professor Z; he is seen during the big lemons meeting at the Porto Corsa casino and makes several appearances after that during some of the film's final scenes. At this point, this character isn't available in stores anymore, but he still can be easily found online (such as on eBay or Amazon). Good luck on the hunt if you're still trying to tack this one down! 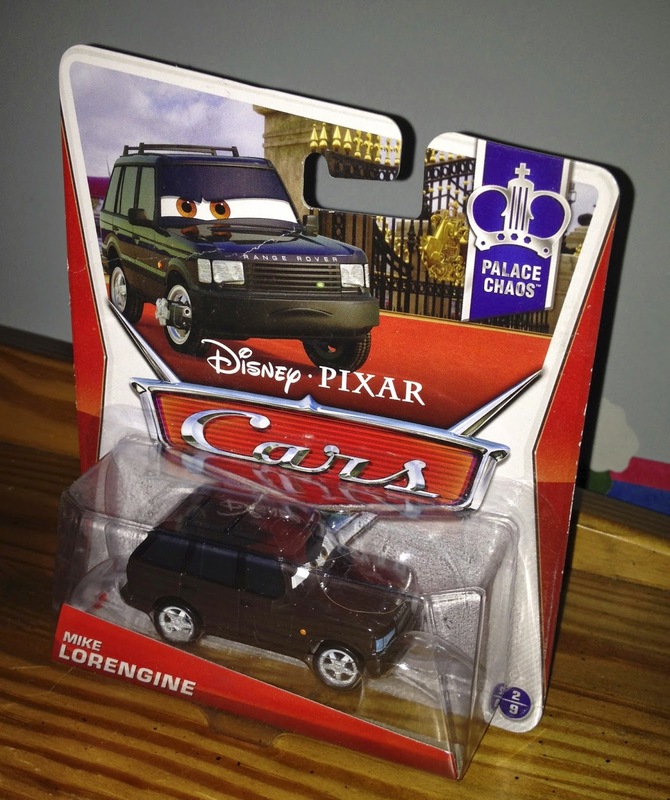 Here we have Mattel's 1:55 scale diecast release of Mike Lorengine from Cars 2! This character was released just last year and was part of the 2013 "Palace Chaos" sub-series (#2/9). As seen in the screen shot above, Mike appeared near the end of the film as one of the Queen's Range Rover body guards at Buckingham Palace. For today's post, here we have the 1:55 scale Mattel diecast release (well, re-release) of Kabuto! 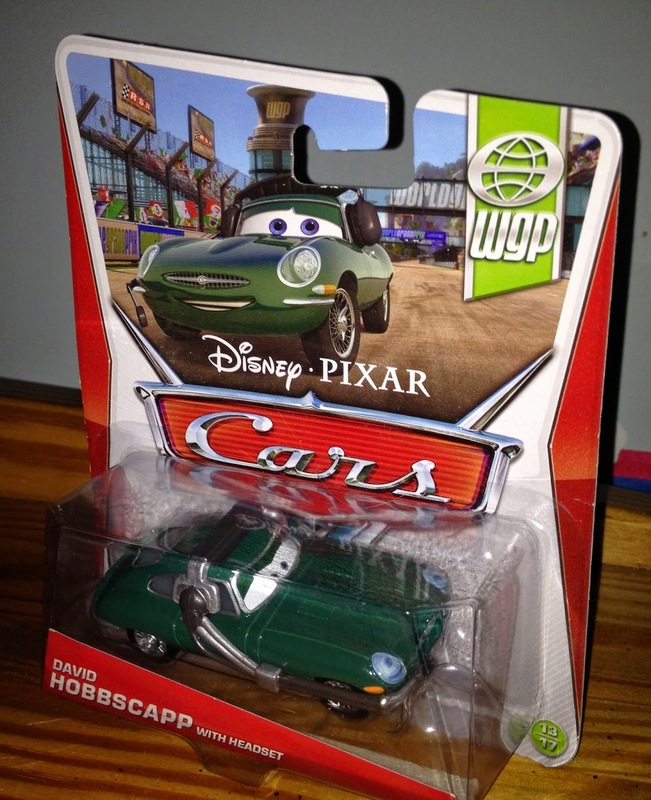 This character was originally available years ago in the "Cars Toon series" and then was released again in the original 2012 "Cars 2 series". He was then released again last year in the 2013 series (the one I have here) and then again this year as part of the 2014 "World of Cars series." Phew! He has sure seen his fair share of releases over the years for being such a minor character in the franchise. 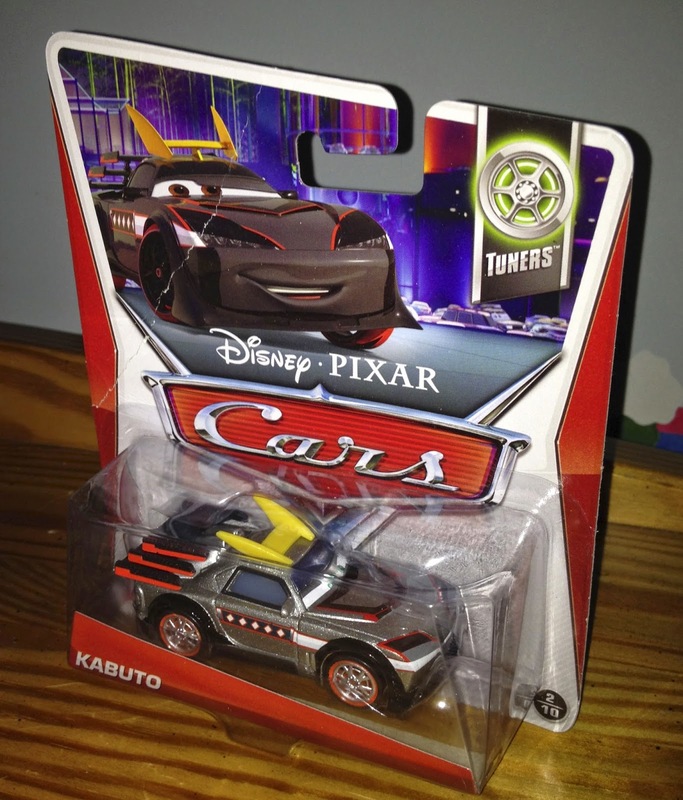 Kabuto was first seen in the classic Cars Toon: Tokyo Mater. 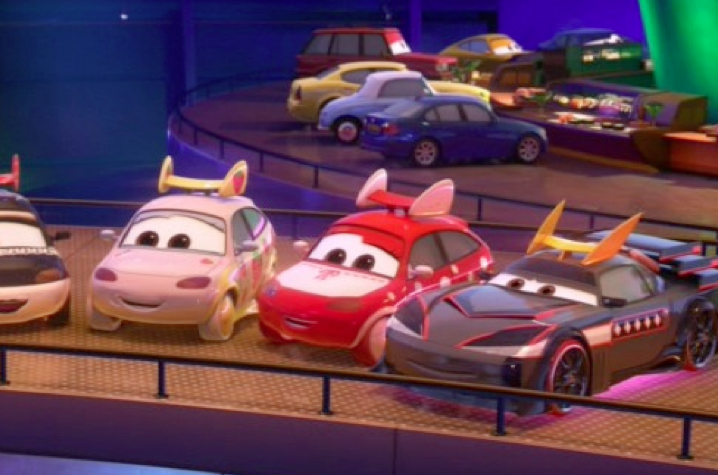 As seen in the screen shot above, he then made a brief background cameo appearance in Cars 2 during the Tokyo party scene. If for whatever reason you have missed this one picking this one up in stores, or if you'd rather just snag it online, be sure to check out Amazon or eBay for the best deals.